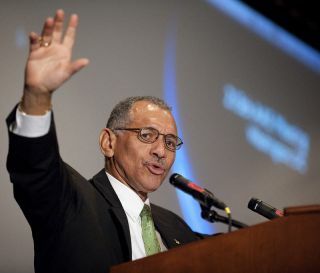 WASHINGTON ?NASA Administrator Charles Bolden will unveil the U.S. space agency?s spendingpriorities for 2011 during a Feb. 1 announcement at NASA headquarters here,according to administration officials. PresidentBarack Obama?s 2011 budget request is expected to realign NASA?s human spaceflightactivities and investments to foster development of commercial systems capableof ferrying astronauts to the International Space Station. The request is notexpected to include a much-sought after billion-dollar boost to aid NASA?sfunding-hampered human spaceflight efforts. NASAcurrently plans to retire its three aging spaceshuttles this year after five more missions. But plans to use the shuttlefleet?s replacement ? NASA?s new Ares rockets and their Orion crew vehicles ?for an eventual return to the moon are still in flux. Next week,Bolden is expected to discuss long-awaited details of the president?s fundingproposal during the Feb. 1 briefing, followed by a press conference hosted bythe White House Office of Science and Technology Policy (OSTP) to rolloutObama?s research and development priorities ? including those that affect NASAgoals and funding ? for the coming budget year, these sources said. The OSTPpress conference is slated for 12:30 p.m. at the American Association for theAdvancement of Science here. A committeeappointed by the White House last year to review NASA?s plans for U.S. humanspaceflight found that the space agency lacked the funding necessary to meetits goal of replacing the shuttle fleet no later than 2015 and returning humansto the moon by 2020. The committee?s report suggested President Obama investmore in commercialspaceflight for cargo and crew trips to orbit, and focus NASA?s humanspaceflight efforts are more distant goals, like the moon, asteroids or themoons of Mars. The gapbetween the shuttle?s retirement and crewed Orion flights will likely be longerthan NASA?s five-year estimate, the committee also found. During that time, theUnited States would be reliant on Russia?s Soyuz spacecraft, and potentiallycommercially built crew vehicles, to launch astronauts into orbit. In additionto the Monday rollout, Bolden is also slated to host a second news conferenceFeb. 2 at the National Press Club here, administration officials said. On Tuesday, a top White House budget official suggested to reporters that NASAcould still see a budget increase for 2011 despite U.S. President BarackObama?s proposed three-year freeze on most non-defense discretionary spending. During a conferencecall the day before Obama?s first State of the Union address, Rob Nabors,deputy director of the White House Office of Management and Budget (OMB), toldreporters that while NASA is among non-defense agencies otherwise subject tothe freeze, not every such agency would see its budget held at current levelswhen Obama sends his 2011 budget request to Congress on Feb. 1. ?I?m not in aposition to say how NASA fared,? Nabors said. ?But it would not be the casethat a request for NASA will be identical to the request that happened lastyear.? Nabors was respondingto a question about whether the spending freeze means no budget boost for NASAnext year. Obama asked Congresslast year for $18.68 billion for NASA for 2010 and said he intended to requestslightly less for the spaceagency for 2011, 2012 and 2013. Sources close to the administration havetold Space News that NASA now stands to get an increase for 2011, but nowherenear the $1 billion boost some space advocates have been expecting since NASAAdministrator Charles Bolden met with Obama in December to discuss the agency?sfuture.